A few months ago, I bought a pair of Yurbuds. After my Bean thought the earbuds I have been using for the last few years looked like a fun toy and took one of the earpieces off and lost it, I just couldn't get them to work with the larger earpieces. So I consulted eBay and bought a pair of Ironman Yurbuds. With my history of unhappiness with earphones, fifty bucks was too much to justify spending, but I'd heard so many good things from other bloggers about them so I found a brand new pair on eBay for half the price. 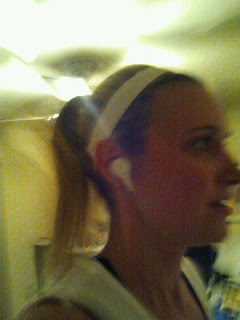 The hubs got my hand-me-downs with the larger earpieces, and I started using my Yurbuds. After the first try, I contacted Yurbuds and asked if they came in something smaller than a size 5. They don't. I have fairly small ears and have a hard time finding earphones that don't hurt. I figured since Yurbuds came in multiple sizes, I would be good to go. Not so much. The Yurbuds "worked." But I didn't love them. I was so excited to test them out! I tried them out on a shorter run and then the next day on an eight miler. They fit! They don't hurt my ears. They don't fall out. They come with four sizes of ECO rings to ensure the best fit for any ears, even mine. The in-line control is awesome. I have a multi-touch iPod Nano, so it isn't easy to change the playlist while I am running. I also have to choose whether I want the power button to change the songs or pause them; it doesn't do both. With Exceed's in-line control, I can easily change the song, pause it, and turn the volume up or down. There is also a model designed for runners who place their cords under their shirts, but I have actually worn my Exceed earphones under my shirt and just clip the cord to my sports bra so the in-line control stays above my shirt. Auria thought of everything. You can tell that some real thought and testing went into these earphones. They sound great while also allowing me to hear ambient sounds, which is great for runners who wear them outside. For me it's good when I'm on Millie and my girls are in bed so The Princess can't sneak up on me and send me flying across the room with one of her many excuses to get out of bed. You get to choose between three color options. I went with Glacier White, although the Black/Hot Pink ones were tempting. The third color is Carbon Black (with blue trim). And like I said, there is also the Provoke model that comes without the in-line control. And Auria has a third model, the Zeal earphones with nano technology speakers. You can find out more about all of Auria's earphones and accessories (be sure to check out all the personalizers) HERE. * I was provided one set of Exceed earphones free of charge. The opinions expressed above are my own. These look like great ear buds. I have problems finding ones that fit too. But my main problem is that I have been through 3 pairs of ear buds because of sweat issues. What can I say, I'm a sweaty beast. It'd nice to know their is an other company we can try if yurbuds dont work for us. Right now I have yurbuds and they are working ok. THanks for the review. I wish I could find something that doesnt have cords to deal with. Hm. That's funny..I never thought of it being my ears that are too small..but mine fall out all the time! I thought that I just had bought a cheap pair and thats what they did!! I like the sounds of the clip! Definitely sounds like they looked into it! I loathe things in my ears, so I really struggle with finding comfortable earbuds. Skullcandy have been my go to, but lately they just aren't doing it for me. I'll have to try Auria and see how they fit. How are they on sweat resistance? Are the water proof or water resistant? I love my yurbuds, but my one complaint is that they really block outside noise! I sweat like a river. I wonder how they hold up? I don't listen to music much due to me being sooo sweaty! Plus I like to hear nature around me. I would love to find a pair that could handle my sweat, though and stayed in. When I am on the treadmill I am currently using a giant pair of headphones! I'd like to start getting in some "reading" with audio books and would love something less bulky! These sound like the ticket!